ASCO offers solenoid valves for virtually any application. Models include general purpose, explosion-proof, intrinsically safe, combustion, and air-operated. They are available in brass, stainless steel, plastic, and aluminum bodies. Enclosures are available to operate from -40°c to 200°c in normal and hostile or explosive environments. 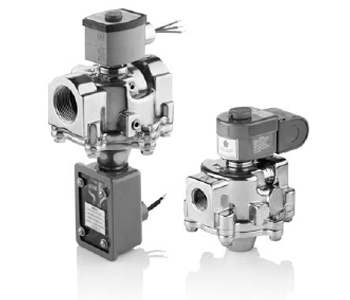 General purpose valves are available to control air, water, light oil, and gases. Pipe sizes of 2 way solenoid valves are available from 1/8″ to 3″. Pipe sizes of 3-way solenoid valves range from 1/8″ to 1″. The pipe size range of 4-way valves is 1/4″ to 1″. Air operated valves are designed with a unique sealing member which isolates the pilot air pressure from the main line. Variations in pilot air pressure do not affect valve operation, constant pilot pressure is not required and standard valves will provide long life while handling dry or lubricated air. Available in 2, 3, or 4 way, with brass or stainless steel body. In pipe sizes from 1/4″ to 2″ NPT. Combustion valves are used for shut off and vent valves, to control the flow of fuel oil and gas in industrial boiler/burner applications. Taps in their aluminum bodies allow for convenient routine testing. Aluminum bodies with pipe sizes from 1/2″ to 3″. Contact GASCO for specific application needs.